Our in house design team was called on again recently to provide bar branding for a casino themed mobile bar for a corporate event. Working with another event company we were asked to provide a casino mobile bar featuring the branding of their client. We quite often work with other event companies, delivering bespoke mobile bars, professional bartenders and all associated extras when required. This particular event took place at the lovely Sopwell House in St Albans, an award-winning conference centre and hotel in Hertfordshire with over 300 years of history. 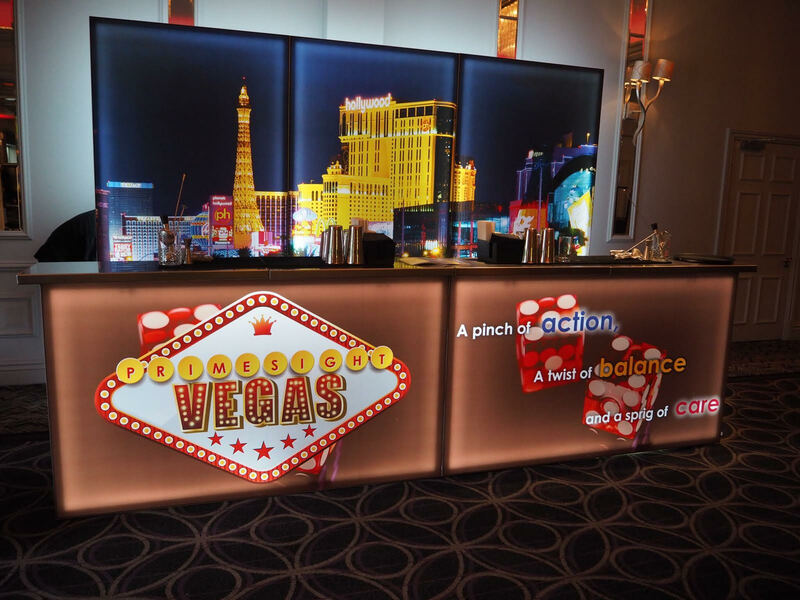 The requirements of the corporate client for this mobile bar were to re-create the bright lights and life of Las Vegas and also to work in the brand using our bespoke bar branding. As a result we created a bespoke fascia for the front of one of our LED bars in the HD Range. 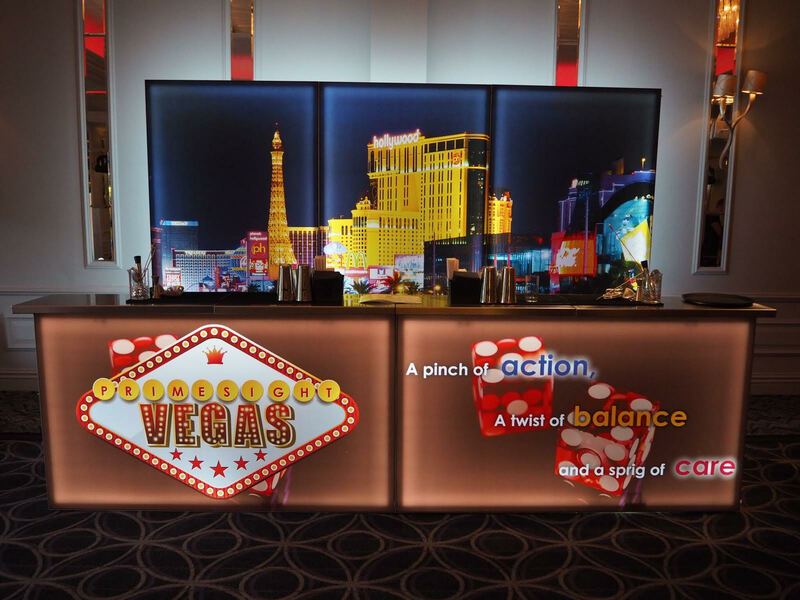 Naturally we designed our casino themed mobile bar using imagery you would associate with Las Vegas and casinos in general – a pair of dice, overlaying the brand and their message across the two different fascia. 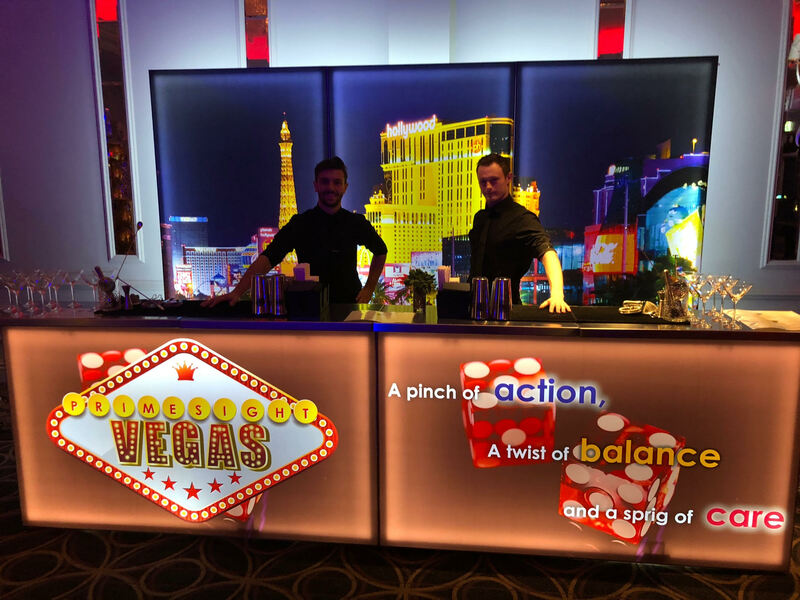 As well as our casino mobile bar we are also able to put together a range of backdrops which can be used as above, behind the mobile bar, or dotted around the venue to reinforce a theme or immersive experience. For this Las Vegas style bar where better to set on our HD backlit panels than the glorious Las Vegas Strip itself! What more could you want for a Las Vegas themed party? Did we hear you say flair bartenders, why of course! 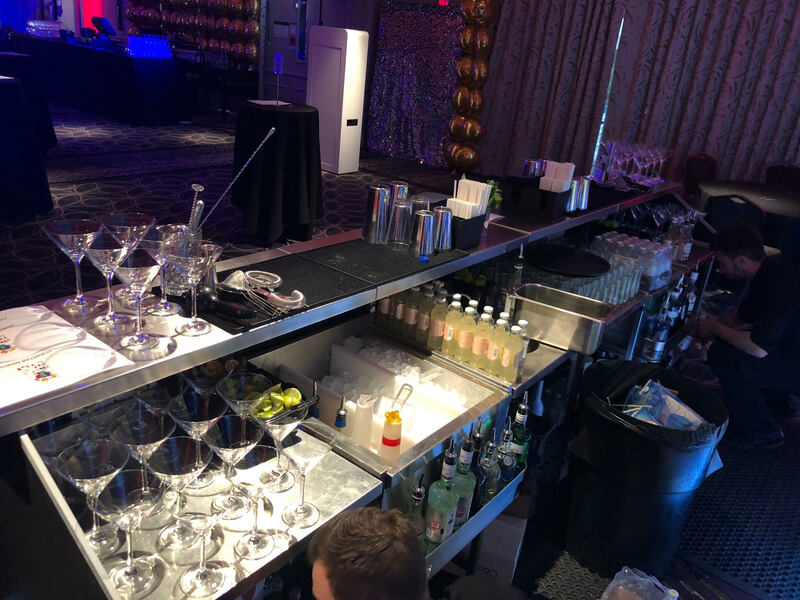 In addition to our casino mobile bar we also provided two of our professional flair bartenders, a delicious selection of cocktails and all associated cocktail tools and barware. Although we would usually provide all the ingredients and glassware too, on this occasion these were provided by Sopwell House. As anyone who has been to Las Vegas before will be able to tell you, not only can you find some of the world’s best Casinos and shows but also some of the worlds best bars featuring exceptionally talented flair bartenders. Through our connections to the World Flair Association we are also able to provide flair bartenders of this caliber. Not only do you get a professional and high-class service but also a good helping of entertainment and a dash of excitement. This of course results in a particularly memorable bar service for your guests. We are able to provide a huge range of cocktails if that is what you would prefer; from the all time classics, to some of our own original creations. The client opted for two classics cocktails and one of our own: Mojito, Pornstar Martini and a Passion Filler. If you are interested in our Casino themed mobile bar, casino mobile bar, bar branding, flair bartenders or anything else – then please do not hesitate to drop us a line!